Well the evaporative cooling is working, I know here in Sidney at my weather station we have cooled 2.4 degrees since the snow started falling... 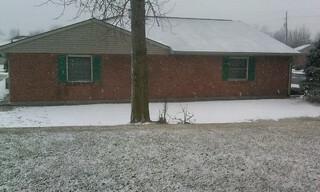 Right now a light dusting of snow as you can see in the picture. Here are a few reports from the readers, keep them coming, just post a comment at the top or bottom of the blog!! Greenville 9:36 "snowing outside my front window right now"
Abbottsville 10:18 "it has about completed the transition from freezing rain to snow"
Greenville 10:31 "it has covered quickly in the last 10 minutes.....we have had no rain....all snow"
Again, keep the reports coming in! Also we will be having special reports on the snow coverage on ABC 22 starting at 5 AM Saturday.... I will be out field reporting for it all day tomorrow, so leave a comment on here letting me know where you live and why you want me to do a snowfall total there and I will try to make it happen, just leave a comment on here.... Like I said before, why not have a little fun with this storm!! I will be back on shortly, until then, have a good one!